This is a difficult letter to write. But I feel the need to tell you the truth. Your third party strategy is not working. You are not making progress with the voters. Don't get me wrong. As a long time political activist, I greatly admire the commitment you have to your political views. I share many libertarian views, including the idea that smaller government works best, that the national government has gone beyond the constitutional limits on its power, and that government has encroached too much on individual liberties. Democrats and Republicans do not hold a candle to the Libertarians when it comes to being philosophically consistent on the issues and the dedication Libertarians have for what they believe in. But many Libertarians have moved beyond the mere debating of public issues. During this past election, I had the chance to spend half of Election Day with volunteers on the Ed Coleman campaign. I was greatly impressed with Coleman's election day organization, including the number of people who volunteered as well as the energy they brought to the task. There was probably not a single Republican or Democratic council candidate who came close to the organization that Libertarians put together for Coleman on Election Day. Libertarian At-Large Councilor Coleman faced off head-to-head with Republican Councilor Jack Sandlin. In an at-large race, well-known community activist Bill Levin threw his hat in the ring as a Libertarian candidate. In the mayor's race, Libertarian Chris Bowen challenged Mayor Ballard and Democratic challenger Melina Kennedy. All were excellent tests of the willingness of the voters to move beyond the two parties and consider the Libertarian alternative. 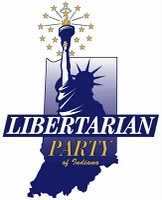 Coleman finished with nearly 24% of the vote, the best showing of any Libertarian candidate in Indianapolis history, but far below winning. Meanwhile Levin, a colorful character who is more connected than just about anyone, ran only marginally ahead of other Libertarian at-large candidates who were not well known. Bowen meanwhile obtained just under 1.5% of the mayoral vote. It is a tough thing for Libertarians to hear, I'm sure. But I'll say it anyway...the Libertarians are not making progress in getting voters to abandon their commitment to the two party system. The Libertarians are getting the same baseline vote they received 35 years ago. It hasn't changed. I know the Libertarian arguments all too well when it comes to my GOP affiliation. Libertarians point out quite correctly the scores of Republicans who are not living up to the principles the GOP claims to stand for, a fact I have repeatedly pointed out on this blog. To Libertarians this represents a collective failure, an indictment of the Republican Party. To me, these are individual failures, an indictment of Republicans who wear the GOP uniform while betraying party principles. It comes down to whether you are more likely to effect change working from the outside, as a third party, or from the insider, working within the two party system, in my case, the Republican Party. While Libertarians suggest the Republican Party is never going to change and it is futile to try, they fail to recognize their own futility when it comes to winning elections or even so much as getting an increasingly larger percentage of the vote. The bottom line is, until Libertarians actually make a dent in the public's commitment to the two party system, the argument that a frustrated Republican wanting change would be better off giving up his party and becoming a Libertarian, fails. Most people pick their party identification by replicating that of their parents. My parents though were Democrats. I chose to become a Republican because of the principles the GOP represents. Do Republican elected officials fail to live up to those principles? Absolutely. Do I want those officials to be more conservative, even more libertarian, in how they act in office? Absolutely. Do I want smaller government and more individual liberty? Absolutely. My hope is to be a driving force for change, in particular within the Republican Party. Will I fall short of effectuating that change? Quite likely. But at the end of the day, at least I am in the game plugging away. Libertarians are not. They are outside of the fence, watching while the two parties play the game. Marion County GOP leadership love it when frustrated Republicans become Libertarians because they have taken themselves out of the game and are not a threat anymore. It does not have to be that way. The Libertarians I have met over the year are intelligent, committed, and even better organized than the local Republicans and Democratic parties. If Libertarians suddenly announced they were going to be active in the Republican Party (I pick the GOP because most Libertarians clearly lean that direction in the absence of a third party), they would be instant players in the political scene and quite possibly come to dominate GOP. But instead they have chosen a third party strategy that is clearly not working. Like it or not, my Libertarian friends, people aren't budging from the two party system. It is time to rethink the Libertarian strategy and to get in the game. There are too many instances where we have seen how libertarians and libertarian policy are treated within the GOP, locally and nationally. In a word, poorly. It is clear that the leadership there has no interest in libertarian policy, so it would make as much sense to me to be involved with the GOP as the Socialist Workers Party. The only differences between the two lie in rhetoric and scale. But your mileage may vary. I don't bemoan one who decides to give the GOP a try. I trust a person to make a decision that makes the best sense to them, for their own reasons. But, I've seen many go and come back- most notably, Andy Horning. I recall Republicans pulling up his signs prior to a general election (not a primary)- when he ran as a Republican! Read Title 23. It's a rigged system. We have no loyalty to this corrupt edifice. Tear the whole thing down, and start over. This government is nothing but a scam run by two clubs at the expense of the country. Until there is complete election reform, our government is illegitimate. This piece is hilarious satire. I cannot improve upon it. Ogden, Thank you for reminding me of precisely how the Republicans pushed me off the couch to become Libertarian. I got tired of Republicans knowing what is best for me. Someday the successful two-party system will finish quashing ballot access for everyone they don't consider to be successful, but until then you will have to tolerate some of us who care more about our principles than success. It doesn't surprise me the reactions you are receiving to your piece, and I may write one of my own. You are correct about a number of things in the piece, but I must disagree with your premise. I do believe there is a place for a third party in this system. The Libertarians serve as an outlet or place for that believe in that party's principles to be. It's much better to have them in the game in some way then disillusioned by Democrats or Republicans. I think Libertarians have a tremendous opportunity to gobble up moderate Republicans that are disgusted with the direction of the party. You are correct that sometimes the best places to effect change are from within. I can't tell you how much the Democratic Party has changed since its inception. Parties definitely can change, and mine is one of them. I do agree that Libertarians shouldn't fool themselves. It's going to be extremely difficult to win major races in elections. Libertarians' aversion to the machine of politics sometimes puts them at a tremendous disadvantage. I'm not convinced that the right Libertarian can't win a high-profile race. Jesse Ventura (not a Libertarian, I know) was elected Governor of Minnesota. Ross Perot gave a heck of a run in 1992's Presidential Race and definitely swung the election towards Bill Clinton after his in-and-out-and-back-in-again mistake. Who knows what will happen in 50, 100, 200 years? Maybe someday Republicans and Democrats will be like Whigs and Federalists...relics of the past...and Rupert Boneham IV will be the first Libertarian President. Jon, there is no place for a first party in our voting system, let alone a second, third, fourth or two-hundredth. A voter should be presented a list of names on a ballot, with no party affiliation being stated. Getting on that ballot should be as simple as getting enough signatures to show there is some voter interest. Names should be presented on the ballot in random order. Of course, there will be no ability to vote straight-ticket, as no tickets will be presented nor identified. Until the laws ensuring the perpetuation of the Republicrat cartel are repealed, the entire government is illegitimate. I love the Libertarians (most of them) but Ed Coleman alienated me completely. So much so, that I quit the party and cut off donations because of him. I know they have donors, but when you have someone who gives up to $1000 a year and volunteered often, shouldn't the donor expect that words are to be honored? I don't throw good money after bad. And the LP leadership did nothing to hold Ed Coleman accountable to his promises. Libertarians lack BRANDING. After a few million are spent in MARKETING THE BRAND NAME "Libertarian" the rest will come easily. It's merely whom markets their products better. And it's the 2 parties that have been doing it the longest. When 1 state GOP fund raiser can raise $9 hundred thousand in an evening and the whole national Lib fund raiser only raises a few thousand NATIONALLY. Follow the dollar. The "HITS" will keep coming out of the big labels. The baby labels might get a 45 here or there.. but they certainly will not see the top 20 in any of the charts. The funds ain't there. I agree with Bill Levin, we need to do a better job of marketing the "Libertarian" brand, which is why I was very disappointed to see Ed Coleman's TV commercial completely devoid of any reference to the word. Please show me the Tv commercial of ANY candidate that said their are Republican or Democrat. Its just not done anymore,when your trying to attract the independents in local elections. The problem is their candidates.They only fielded one good candidate. The rest were place holders. They need to re-brand the party. Get rid of Libertarian label and come up with something more up to date. The American party, the Tea (oops that one is taken ;) ) Party. The Libertarian name is damaged and any good advertising executive would tell you it's time for a name and branding change. An over-focus on "branding" is a problem on loan from democrats & republicans in abdication of principle. It's simple. As you articulate & circulate principles, you will be thusly defined. I like the America First Party. Bah the globalist parties.